Although it is consumed all year round, in the summer months, people consume the most dog meat. 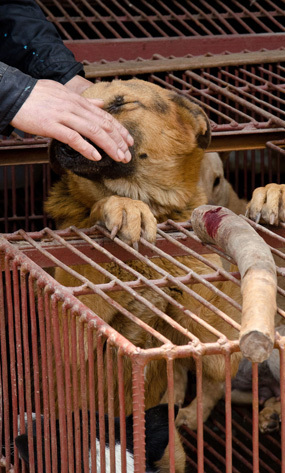 People can purchase dog meat in small markets, along with chicken and pork, and there are also small and large dog meat restaurants on the streets. I arrived at the animal market when it was already almost noon. Most of the animals sold here were birds (chickens, ducks and geese). I saw dogs trapped in small metal cages. Again, the dogs were extremely submissive and showed no aggression when people approached the cages. I never saw anyone providing the animals with water while they were held for hours in the cages. The cats were cramped also in cages, lying on top of each other. The animals were filthy with their own excrement, and the excrement of their cage mates. This meant the cages had a strong stench. I never saw anyone providing the animals with water while they were held for hours in the cages. I asked a cat seller how much the cat meat was being sold for. He told me that it was 8 RMB (1 Euro) per 500 grams. I never saw anyone providing the animals with water while they were held for hours in the cages. I noticed that some of the dogs and puppies were wearing collars. When I asked why a German Shepherd-type dog was wearing a collar, the stall holder told me that it was his dog, yet this animal was also caged alongside the other dogs. The stallholder opened the cage to show me the dog, who cowered in fear. I’m guessing he told us it was his dog so that we wouldn’t think he was someones pet who had been kidnapped to be sold as dog meat. On top of the cage lay a blood-stained wooden stick which was likely to have been used to kill dogs in front of cage mates. On the ground in front of the cage was a spot of fresh blood. Some dogs were observed running free in alleyways. Others were chained. I was told that these dogs were not for human consumption, and were peoples’ “pets”. But what is the difference between these individuals and the dogs in cages who would soon be killed? On what criteria do humans decide who should be caged and eventually eaten, and who should be spared and kept as a member of the family?